Dr. Tim Amukele, with Johns Hopkins, walks away after handing-off a package of simulated blood, and other medical samples to be carried in a drone for a ship-to-shore delivery simulation in 2016 in New Jersey. Drones are no longer a new or emerging technology. They’re a part of everyday life for insurance companies, photographers, law enforcement, and the military. And they’re already saving lives in emergency response situations. That’s according to Keenan Campbell, director of the Bureau County Emergency Management Agency. Campbell will deliver the keynote address at Friday’s 2nd annual Drones in the Heartland conference at Heartland Community College in Normal. Drones are especially useful for emergency responders trying to get situational awareness after a natural disaster, like a tornado, said Campbell. They can be used to confirm a damage path and help officials make a disaster-declaration decision, he said. Drones can also be used to find missing children, boaters, or those with dementia who’ve wandered away from a long-term care facility, Campbell said. Campbell estimates that only around 20 percent of Illinois’ county emergency management agencies have a drone, though some can share through mutual-aid agreements. 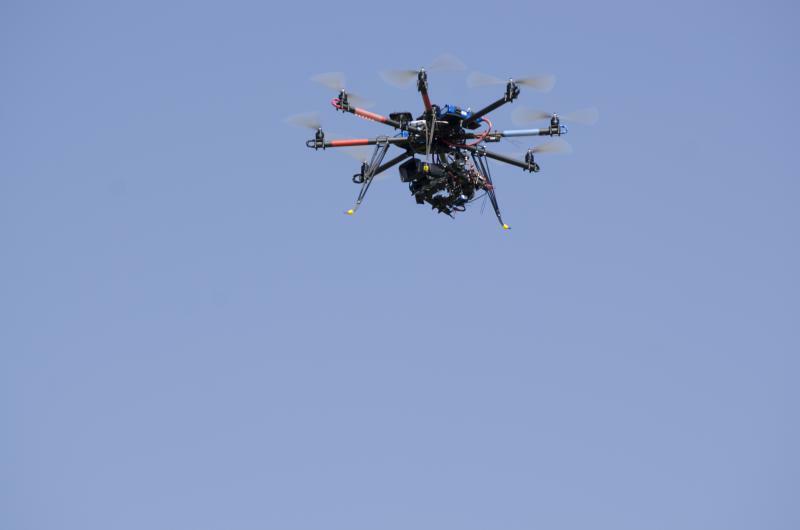 Campbell’s agency uses a DGI Phantom 3, which costs between $2,000 and $4,000 and has a range of around 3.2 miles. Drones, also known as small unmanned aerial vehicles (UAVs), can reduce safety risks for search-and-rescue operations, helping humans avoid trips and falls or extreme weather conditions. They’re especially good for exclusionary searches—or ruling out an area where a person might be found—and can survey a corn or soybean field much more quickly than someone on foot, Campbell said. There are barriers to more widespread adoption, he said. FAA rules require drone operators to have a visual line of sight on the vehicle, meaning that 3.2-mile range can’t be fully utilized. The rise of amateur drone operators also presents challenges. “I can’t tell you how many times we’ve had an operation and my phone starts ringing from people saying, ‘I have a drone! I’d be glad to bring it out.’ Well, that’s not what we do. I can’t have private citizens flying drones on the county EMA’s behalf," Campbell said. “We really need to educate our policymakers that they’re not bad. We’re not spying on somebody. We’re not doing anything that could be construed as bad,” he said. Other breakout sessions at Friday’s drones conference include agriculture applications, educational practices, regulations and safety, and innovation. The conference will also have demos, sessions with tips for those taking certification tests, and consumer information for those looking to purchase a drone.